Over the years, staff at the University of Illinois Archives have answered numerous questions regarding the origin of the terms “Illini” and “Fighting Illini.” This post answers some of the most frequently asked questions on these topics by summarizing evidence found in the Archives’ printed collections. Links to digitized sources are provided. Many additional sources may be consulted by students, faculty, and members of public during our normal hours. When and how did the term “Illini” originate? 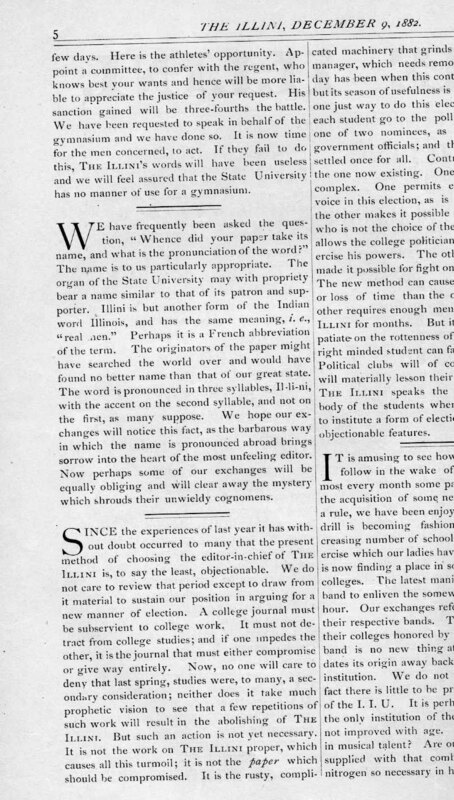 The earliest recorded usage of the term “Illini” appears to have been in January 1874, when the weekly student newspaper changed its name from The Student to The Illini. An editorial (pdf, 150KB) in the first issue of the renamed journal (Volume 3, Issue 1) implies that the term was coined and had not formally existed prior to 1874. A similar statement about the name appeared in the December 1882 (jpg, 268KB) issue of the Illini. During the late 19th century and the first years of the 20th century, it was often used to refer to the students, faculty, staff, and alumni of the University, as well as to the campus as a whole.